Enjoy our new paradise in Bonita Springs . You will appreciate a very charming and warm area. Our waterfront home will make you feel like you are already in paradise . Listen the birds singing , fish in the canal and eat it after , swim in the heated pool and make yourself at home with our new and confortable beautiful furnitures . The peoples in Bonita Springs are so warm . Welcome in our home . Make yourself at home . We simply adore Bonita Springs, the first time we went there, we thought we were in Paradise and we still feel that way ... They call this city the golfer's paradise ! The birds sing all the time , the view of the pool and the canal is unique . You will never forget your vacation in this area . 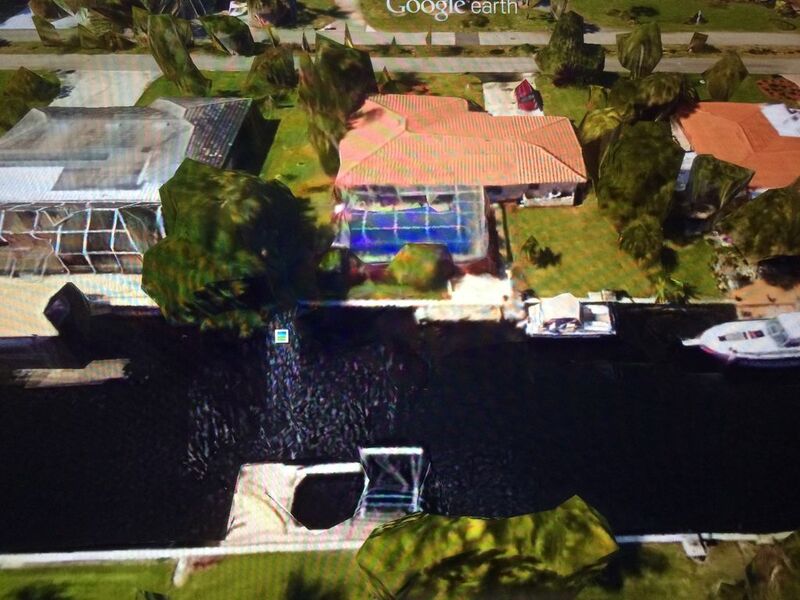 The house in in front of a canal given access to Imperial River, Golf and a lot of restaurants by boat too . If you are looking to be close to everything, this is the place to be. Grocery stores, malls and restaurants are all less than 10 minutes away. Everything you need is available in the house from kitchen utensils to linens. We took our beach towels only to find they had plenty there for six people. If you are looking for clean, however, this is NOT the place to be. We had to sweep and mop the floors when we arrived. I don't think the end tables, coffee table, headboards, etc. have seen a dust cloth in months. The pool area was covered with bugs, leaves and dirt which we cleaned the best we could with what was available. It's unfortunate this place isn't better taken care of as it's a perfect place to stay if you have to be in the area for an occasion. We had a real nice stay and very comfortable for 6 adults. It is a older dated home. We tripped a breaker once from having 2 blow dryers going at the same time but we called the maintenance guy and he was there in 5 mins or less. Over all was a real nice vacation. Every thing was perfect, nice house and beautiful area. Great Value for this Lovely Spacious home . Our family of 5 adults and one enfant recently spent a wonderful week at this lovely property in early May. As noted by other reviewers, the pool is a generous size. We particularly liked the walk-in steps and the deep end which made swimming that much more enjoyable. The house is fully equipped with everything you need to enjoy your vacation at the home, or at the beach...there even was a playpen which was better for our granddaughter than the travel one we brought. Bikes were included as well. We especially enjoyed the use of the garage which was great to keep our car cool on hot days. There is a convenient pass-through from the kitchen to the patio which made dining outside very convenient. We loved the location because it was on a lovely quiet street and convenient to everything. Stores were within walking distance. One day we saw six Ibis strolling through the boulevard. Barefoot Beach was only 10 minute drive away. We saw a number of large tortoises along the road there which was a great surprise. There was lots of seating available both inside and out of this spacious property including down by the canal where we watched the jumping fish and turtles. The owners were very accommodating and easy to get in touch with. They even called us in advance to give us a "heads-up"of a service visit for pool maintenance. We definitely would love to come back next year. Excellent Vacation. We will be back!! We stayed at this lovely, spacious home for two weeks in June 2015. We went with our adult daughter and teenage son and with the three bedrooms we all had our own space which was great. The table and chairs by the canal was a great place to have my morning coffee. The pool area is huge and was by far our favorite spot to hang out. The pool is very deep on one side but was great for swimming laps and floating around reading a book getting rays. The neighborhood was very safe and quiet with beautiful landscaped homes. I love the area of Bonita Springs. The beach was incredible and comparable to the panhandle where we usually vacation. We actually liked Bonita Beach better then Sanibel Island which we visited for the day. Bonita Springs is central to Naples, Fort Myers, Sanibel and Captiva making it a good central point to make day trips to these other towns. It is very close to Estero which is a wonderful place for shopping with outlets and the Coconut Mall. We recommend Doug's Seafood for Lobster Rolls and the Fish House for a reasonable priced dinner. Also try the Bonita Fairways (right across the street) for some reasonably priced golf (3 to 4 par holes). There is a $ 5.00 coupon in one of the coupon books. Beautiful Home & Great Vacation! We had a wonderful stay at this lovely home in Bonita Springs. The property is located in a beautiful, quiet area. The home is beautifully decorated, with high-quality, comfortable furniture. Our family enjoyed the privacy of the 3 bedrooms and 3 baths, but the pool area takes the prize. We enjoyed our days in the pool area, and were able to entertain my brother and sister-in-law, who live in Bonita Bay, in the evenings. They were very impressed with the home, and will definitely recommend it to our extended family when they visit the area. Ft. Meyers areas, which have a lot to offer. We are thrilled to have found this beautiful home and hope to rent it again in the future. The owners Micheline and Gilles were personable and easy to deal with, and we want to thank them again for the wonderful vacation that we spent in their home. If you cancell your reservation we will refound all your deposits if we rent the house to someone else for the same dates .